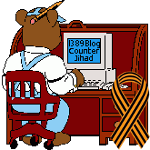 Ukraine radical Yarosh calls on ‘most wanted’ Chechen terrorist Doku Umarov ‘to act against Russia’ — 1389 Blog - Counterjihad! Yarosh leads the far-right militant Right Sector group and used to be a leader of radical nationalist group Trident, which became the core of the Right Sector. Yarosh attended the February 21st political gathering at the renamed Independence Square shortly after the signing of the deal that returned the country to the 2004 constitution. He shared the stage with virtually all of Ukraine’s prominent opposition politicians, including former superstar boxer and leader of the Democratic Alliance for Reform, Vitaliy Klitschko. In the following video, surrounded by masked units from his far-right following, he declares victory and vows to continue fighting, as the crowd cheers in a military fashion. Umarov, who commanded groups of militants in both Chechen wars and organized several large terror acts, is the most wanted terrorist in Russia. Umarov has claimed responsibility for several attacks on Russian civilians, including the 2010 Moscow Metro bombings and the 2011 Domodedovo International Airport bombing, which killed dozens of people and injured hundreds. In March 2011, Umarov was put on the UN Security Council’s Al-Qaeda and Taliban Sanctions Committee list of individuals. The US government has also announced a $5 million reward for information leading to the terrorist leader’s capture. The self-proclaimed ‘Emir of the Caucasus Emirate’ routinely recorded video addresses, in which he incited terror attacks against Russian government forces and civilians. He last appeared alive in a video posted on the internet in summer 2013, calling to step up terrorist activities and thwart the 2014 Sochi Winter Olympics. Umarov’s long absence led rumors of his death to spread, but so far this has not been officially confirmed. The Right Sector social media VKontakte page had over 375,000 followers and was used for coordinating the actions of the movement’s cells across Ukraine. The Right Sector expects us to believe that their VK account was “hacked” and that they had nothing to do with the pro-jihadi posting? That was Anthony Weiner’s excuse for the lewd “selfies” he sent to young women via Twitter. Didn’t buy it then; not buying it now.